(06/23/2015): The natural preservative system used for this product is not stable in extreme temperatures. I highly recommend against ordering and having this product shipped overseas in extreme temperatures, particularly during summer months. There have been consumer reports of spoilage of this and other products in this line due to the sole reliance on the natural preservatives used. (06/18/2014): I’ve heard two separate reports this week about a contaminated batch of Benton Snail Bee Essence. The contaminated product has visible bits of mold in it. I’ve written to Benton to ask about it – Mr.Lee promptly replied, and assured me that he is taking the matter very seriously. The contamination is confined to product manufactured on 3-5-2014 (March 5, 2014). Mr.Lee is currently investigating the matter in order to prevent it from happening again. If you have any product from this batch, he encourages you to contact him. He will ensure that your product is promptly replaced at no charge. If you have photos, please include them in the email. Please also let the seller you bought it from know that you received contaminated product. UPDATE (06/21/2014): Mr.Lee, the owner of Benton Cosmetic, has written a personal message for all customers affected by the contaminated product. The company is offering a refund in addition to the replacement product, and is working with their manufacturer to ensure this never happens again. I’m really impressed with how promptly and professionally Benton has handled this incident. You can find the official message along with instructions for receiving your replacement and refund on my Facebook page here. Snail Bee High Content Essence ($20) is one of the three Benton products I credit with healing a nasty acne rash I’d been struggling with. The acne scourge stubbornly camped out on my face for well over 2 months, but once I switched my skincare products out for the Benton lineup, my face healed almost completely in two weeks! Since then, my face continues to improve every day, and it is for this reason that I’m dedicating this week to Benton product reviews. I am so enamored with this product line that I am swapping out many of my baseline skincare products to make room for Benton. My baseline products don’t change very often, so this is a big deal for me! 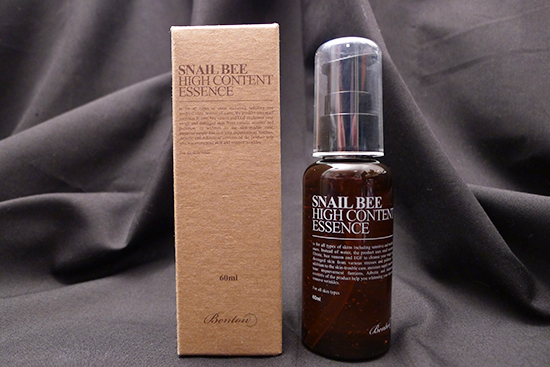 Benton Snail Bee High Content Essence, despite being called an essence, is actually a gel. To complicate matters even further, I like to think of it as a serum because there are so many great actives packed into it. This product is marketed as being anti-acne, anti-wrinkle, whitening/brightening, and moisturizing. Salicylic Acid – Listed as Willow Bark Extract in this particular ingredient list, Salicylic Acid is a beta hydroxy acid (BHA) that is often used as an acne treatment. It is a naturally occurring ingredient, usually derived from willow bark, but also occurs in other sources, such as Aloe. It’s antimicrobial, anti-inflammatory, and an exfoliant. Salicylic Acid has been shown in multiple studies to improve barrier function and collagen production. It’s best used in concentrations from 0.5% – 2%. Beta-Glucan– Beta-Glucan is comprised of sugars derived from the cell walls of fungi, yeasts, lichens, or other plants. It’s used in medicine to boost the body’s immune system in cases where normal immune defenses are weakened by conditions such as chronic fatigue syndrome, chemotherapy, or emotional stress. Topically, it’s used to treat dermatitis, eczema, wrinkles, wounds, and burns. It’s anti-inflammatory and promotes collagen production. There are many more great actives in that list – I had a hard time culling my favorites down to 7! When I ran this list through COSDNA, there were no red flags for acne triggers or irritants. In fact, nearly everything came back as a 0 in terms of risk, with the exception of Butylene Glycol, which scored a very unalarming 1 out of 5 as a potential acne trigger. 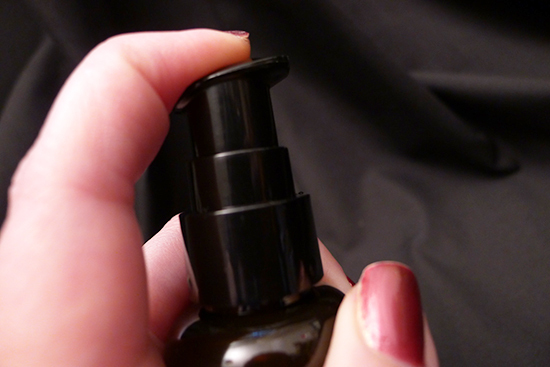 I use Benton Snail Bee High Content Essence immediately after my toner, before applying any moisturizer. I use 3-4 pumps every morning and night. The consistency is that of a light gel, and it absorbs into my skin very quickly with no residual stickiness. 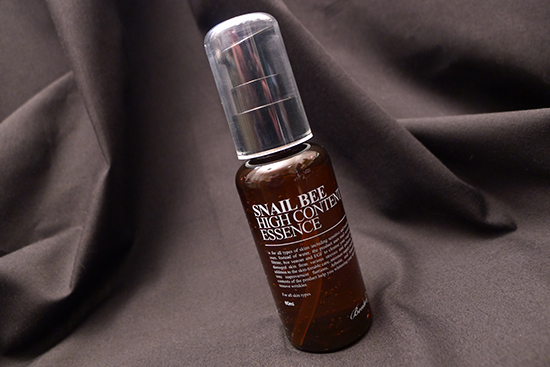 Snail Bee High Content Essence comes packaged in a plastic pump bottle. The pump performs really well, and does a great job controlling the amount product being dispensed. The packaging for the Benton line overall isn’t glamorous, but it does have a very refined look to it that I enjoy seeing on my product shelf. The bottles all look very serious, as they should, since they contain such serious ingredients! 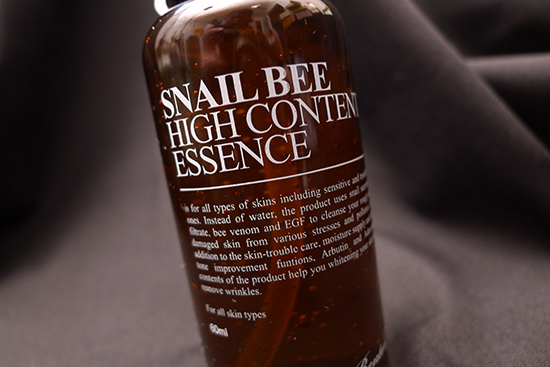 If you’re only going to try one product from the Benton skincare line, it should be the Snail Bee High Content Essence! It is a fantastic gel serum that actually delivers on the grand promises it makes. In two weeks, when used in conjunction with the Benton Aloe BHA Skin Toner and the Benton Aloe Soothing Gel, it has managed to heal my acne, begin lightening my post-inflammatory hyperpigmentation, and brighten my overall skin tone. It also has some lovely tightening properties that have been nice for the few fine lines I have. I really appreciate the fact that this product tightens without making my face dry. Even though I have been using the Snail Bee High Content Essence in conjunction with other products, I highly suspect that this product is doing a lot of the heavy lifting, due to the high concentration of actives in the formula. I think oily skin types would love this product as well, as it is not at all greasy or sticky. Value: 5/5 – It’s surprising to me that this product is only $20, as it performs better than almost any other serum I own, including the more expensive ones! This product is not sold in the US, so you’ll have to order it from South Korea. I purchased mine for $20 with free shipping at I Am Love Shop on eBay and was very happy with my experience. My order arrived at my door in North Carolina in about 10 days. What is your take on using this essence with the Mizon snail recovery gel? I just bought a bottle and it arrived today so I’m wondering how I’d use the two together since they’re both gel like? I think it would work great with the Mizon Gel! It’s a different texture than the Mizon Gel – more watery-like. The Snail Bee Essence pretty much disappears into your skin after you apply it, so you could smooth the Mizon right over it with no issue! You’re welcome! And that Mizon Gel is pretty great too. During the day, I think it actually makes a nice makeup base! I bought this last week on your recomendation, and I cannot wait for it to get here! I didn’t realize that they had other products as well, so if this works out I’ll have to get those, too! Thanks for introducing us to this line. Yeah, the other products are amazing too! I’ll be reviewing the Aloe Propolis Soothing Gel tomorrow, which has also quickly become a favorite. I hope your Snail Bee arrives soon! I tend not to spend that much, even on skincare, but it sounds kind of worth it. Very informative review. Maybe I’ll eventually talk myself into buying it. Haha. It’s worth its weight in diamonds! I am tempted to buy this product as I’m having a problem to get rid of my pimple that always appear on my chin..
Ugh, yeah, chin pimples are the pits! Does it happen every month? Have you already tried other products on it? My order for the toner, essence, and gel came today! I was really excited to try it out. However, I have oily skin and the essence and gel left my skin sticky. But it dramatically reduced my redness and acne scars. I was also wondering whether you wait after the toner is absorbed into your skin and then put on the essence? Is it better to rub or pat everything on? I usually put the essence on immediately after the toner, without waiting for it to absorb. With the toner, I just pat, but with everything else, I gently massage it in. I hope that helps! Great review! I’ve been using this for about 3 months now and I love it. It absorbs so quickly, nothing sticky about it. It feels like nothing on my skin. It’s definitely doing something as my friend commented on my skin the other day. She said it was glowing!! Now that’s not a word my acne prone skin is accustomed to hearing. She was so blown away that she ordered a bottle herself the next day. I just ordered a backup as I don’t think I can be without it. Glad to see there are other fans. I really want this line to succeed. It’s so hard to find skincare this good for your skin, minus silicones which cause me to breakout like crazy. Hai, i’m so curious about benton after read your blog. Almost give up with my redness, acne and scar. But i’m too afraid to buy all the products so i wanna try one of them. what do you think? it is good to try this essence first or aloe propolis gel? cuz now i’m using wonderpre freshner from etude and waiting my snail gel from secretkey. By the way, this is a great post and now i’m become your reader and waiting fpr another amazing review. 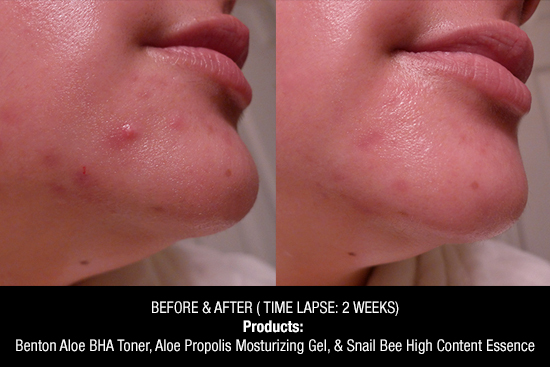 If you’re just going to try one product, I would suggest trying the Snail Bee Essence first. I think that will give you the most dramatic results, although I do think the Aloe gel would be great for your redness! hi, im really love your review. it makes me want to try the essence and steam cream. but, im wondering is this okay, if i mix those two benton with any kind of SK II product? Oh my goodness I love the ingredients list! Definitely gonna get this, I rarely see asian beauty products with such a clean/ natural ingredients list! :O Just wondering, How would you compare it to the Mizon Snail Recovery Gel? I was originally planning to get that but then I saw this review and now I’m just confused lol. Which would you recommend as having better results and/or is more calming (I have pretty hypersensitive acne-prone skin)? Hey Grace! I 100% agree about the rarity of an ingredient list like this one! I think this essence would be a nice compliment to the Mizon Snail Recovery Gel. They are very different product types – the Mizon Gel is more of a moisturizing product and the Snail Bee Essence is more of a treatment-only product. As a treatment, I think the Essence produces more dramatic results, but it doesn’t moisturize enough to work as a standalone moisturizer. But if you spread the Snail Recovery Gel right on top of this, you’ve got yourself a winning combination! so right after reading your review and seeing the before and after pictures, i ordered a bottle from iamlove-shop on ebay. 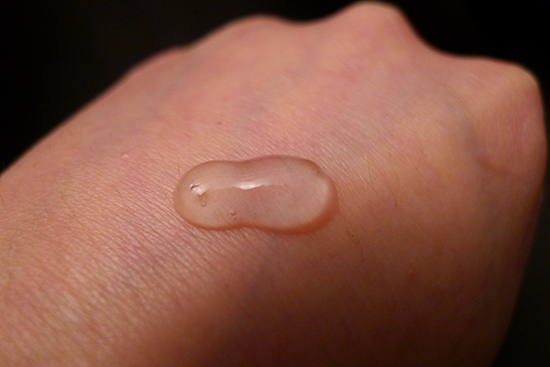 i thought snail slime is crazy but if snails can constantly heal themselves with their slime, my skin can too! i’ve been using the product for about a week and immediately noticed my skin felt more hydrated and the acne started to get under control! i only have a couple small acne spots but it’s so much better than it was before when my skin was constantly erupting in moderate sized pustules. i’m so glad to have been introduced to korean products. i thought i knew my stuff about skincare, but nope! i can’t wait to try other stuff. keep the reviews coming! That such awesome news! I love this stuff! What else are you thinking about trying? Thank you so much for the post~ I took the plunge & ordered and you were right – this snail bee venom essence is their star product. Definitely worth it with my trouble skin ^^ Thank you! Yay! I’m so glad. It’s such a great feeling to find a product that works so well! Your review is amazing! I’m using missha snail cream right now and your review about that product sounds pretty good too. But I’m quite curious with this benton products after seeing your review. Which one do you prefer better, missha or benton? Cause I want to re-purchase missha snail cream but it’s quite expensive, and if benton is greater than missha, i would like to give it a try. does anyone know about the ethical (or not so) treatment of the snails and bees? i love both snails and bees so much as well as hearing they can offer beneficial qualities such as these products, but if there is anyone who knows about the condition/treatment they use for production, please let me know! This is really a great review! I’m planning to buy Missha’s cell renew snail cream and I came across this post. I’m wondering if I can use Benton’s essence in the morning and Missha’s snail cream at night? What would you recommend? Thanks! Hi, Paula! You can actually use the two of these together morning and night! This Benton product is actually a treatment, whereas Missha’s Snail Cream is a moisturizer. It’s basically as if you’re using a serum and moisturizer together – I think they’d make a great pair! Aw man, Alyssa, that sounds like a huge a disappointment for you! Hm could this be the reason why I’ve been getting millia or red dots after I apply it? I’ve never been stung so I don’t know. But I have no reaction to the steam cream at all. Odd. Very strange! It definitely sounds like you’re sensitive to something in the essence, though if you’re fine with the steam cream, I doubt it’s the bee venom. i thought the closed comedones ive been getting on my face were milia at first, but they seem more like closed comedones : ( i think the benton’s essence is the culprit. i also bought mine from ebay! maybe i’m allergic to bees too. im so sad!!! 🙁 me too. i forgot i have really sensitive skin to insect venom. i bought both the steam cream and essence, and every time i use them i either get little red bumps, or small hives that turn into scabs, or milia. i went one week without using them, and my face cleared up and i had no incidents. suckssss. Hi! Love the review. I was wondering if there was a way to buy this in Korea. I saw on the post with the interview with the makers that there was no physical store you can buy this in. Is there a cheaper way to buy this here in Korea? Hey Suze! As far as I know, Benton is still only available online. If someone else knows any different, maybe they’ll chime in! Hi! I really love ur review hehehe . I’ve been using benton steam cream for 2 weeks and slow but sure it really help reduce my acnes hehe. And then now, i had purchase 1 set of benton , but i am confused,, i wondering if i start to use essence first or essence with cream, or all together with toner and gel ? Hi Christine! I would use all of the products together in order from the thinnest consistency to thickest. In this instance, that would be toner>essence>gel>steam cream. Your reviews for this line has pretty much sold me on buying the essence and the steam cream. However, I was wondering it you recommend extending this product down the neck and possibly the chest area? I sporadically break out onto my chest once in a blue moon and it tends to leave scars afterwards. I suppose if it’s good for the face then it should be okay elsewhere? Getting a bid long, but also, do you think these two products would be good for a starter, or should I just buy the whole starter kit? I just wanted to say that I JUST found your site and I am so happy. I love all of your reviews and thanks to you I just ordered all 4 Benton products that you reviewed. I can’t wait to receive them and see how they work for me. Thank you so much for all of your thorough product reviews. Please keep us updated, I’ll definitely be purchasing this once Benton resolves their current contamination issues. Wonderful site, we seem to have very similar skin needs and battles. Hi Isabelle! I have an update from Benton – the contamination is confined to products that were manufactured on March 5, 2014. I know that Alice at W2Beauty has already pulled all the stock manufactured on that date from her inventory, so if you order from there, you should be golden! Hi there! Thanks to your update, I was able to confirm what I suspected — I got one of the essences from the contaminated batch. I got it from RoseRoseShop, and it looks like something similar to pond scum floating in the essence. Do you have the email address that I can use to contact Mr. Lee? Thank you! this serum definitely calms my red hyperpigmentation, but i’m afraid it’s been breaking my face out at the same time. i started getting these small closed comedones, they look like tiny raised pinprick blemishes that have really been ruining my skin’s texture. i started getting them a few days after i tried benton’s essence : ( has anyone else experienced similar results? I had the exact same reaction as you! At first I thought it was just me over doing on my skin care routine by implementing too many steps at once. I gave myself a break and let it heal and then tried the essence again. Exact same results. I do however have the batch that has been contaminated and upon further inspection of the bottle, I noticed “milky fuzzes” close to the top and some spots in the middle. Not sure if that’s why made my skin react in such a way or not. But I’m glad I’m not the only one that has had this. I was really hoping it would work miracles like the rest of the reviews that I read on this. Hi Milly, how are you able to tell if you have a bottle from the contaminated batch? There are several dates stamped onto mine but I’m not sure which date indicates the batch manufactured date. I don’t think the essence is very moisturizing, personally – it definitely couldn’t be used as a standalone moisturizing product. If you already have a great moisturizer that you like, I think the essence is the way to go. If you have dry and/or sensitive skin and are looking for a new moisturizer, the steam cream is definitely worth a try! Hi, I had the same problem with one of the poster from above. I bought a contaminated batch from rubyruby76 (which seems to have came from the roseroseshop), I bought it on June 29, 2014. Potential buyers, becareful from ebay sellers! Do you think it’s possible to combine the Benton essence with rosehip oil? After trying applying the Pai rosehip oil after the Benton essence for a few days, I got a huge acne and some small pimples on my face. Then I stopped using the rosehip oil to see if the problem is due to it or the Benton essence, but the small pimples are still there. 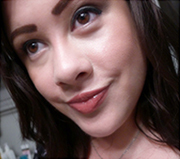 Only the acne disappeared, which is actually, I guess, to 90% the result of its natural life cycle. It healed itself. May you happen to know if there is any conflict between the ingredients of the two products? Wow! i am so pleased with all the ratings you give to this product. I ordered this and it arrived yesterday here from w2beauty and I am excited to start using it tomorrow. Great review! I’ll be buying a bottle this week. Hello! I just wanted to say that I love your blog – it’s v v informative and I love the way it’s written. I’ve (suddenly) developed an interest in Korean cosmetics and skincare so! I’ve been thinking of using a serum, but my mother thinks it’s not such a good idea for teenage skin, but the Benton essence sounds promising! Do you think its gentle / suitable enough? I have combination skin that tends to be oily because I live in a humid country. Thanks so much and yeah I really love your blog! Was about to buy the samples from roseroseshop.com but am worried about the contaminations? Are there still contaminated ones in the market out there atm? Or am we safe as long as it was manufactured after March 5, 2014? I’d started using the Mizon recovery gel and all in one, which seemed to work well. I’d just received the Benton Essence and Steam cream samples today. I’m not sure how to use them all together; as in step wise. So, it’s toner, Benton Essence, Mizon Recovery Gel? then Benton Steam Cream, Mizon all in one? then moisturiser? Update: They are resending the sets. 🙂 Still waiting. So far the little bit I have does not seem to have made much difference yet. I currently use the Obagi skin care line to correct my dark spots. Do you think I could use the essence and toner in conjunction with these? I just ordered the essence as well as the steam cream. I live in the US (NJ) and am now worried the products will be spoiled. How will I know if they have gone bad? Any ways to tell? Thank you! This looks amazing! I hope you can help with my question and I’d really appreciate if you can answer it — can this serum be used after Biologique Recherche p50 lotion? (If not, do you have any reccomendations?) I have a very oily t-zone, acne prone skin but it’s also dehydrated. Thanks for your help! Because this essence/serum contains a lot of natural products, would there be a specific way for storing it? :/ Living in Cali, weather is really hot right now, so i’m concerned if this would go bad or moldy soon.. Would storing this in my fridge help it be able to last longer? Since this contains so many actives, I was wondering if it would be okay to use with Finacea (azelaic acid)? I have subtype 2 rosacea, and while Finacea has calmed things down a bit, my cheeks are still red and throw out errant zits. I’m trying to introduce my skin to nourishing products and this sounds quite wonderful.